Some results of the genetic study under way of our Arabian pariah desert dogs have been shared with me by Dr.Elaine Ostrander and her team at the National Institute of Health. All dog have now been identified. (See below). The dogs cluster in 2 groups, one showing a genetic connection to Basenjis. 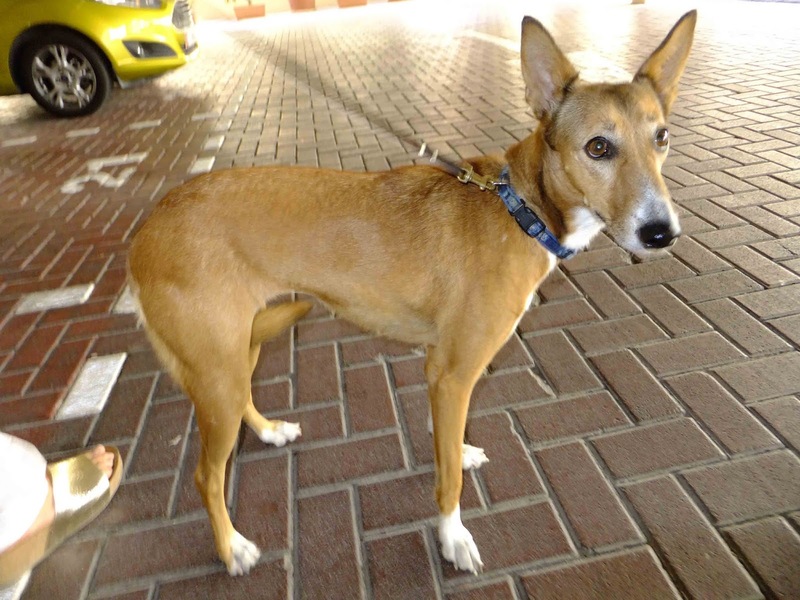 This is not surprising considering that Basenji dogs would have been established from dogs that moved to Africa through the middle-east so some of their genetic material would be expected to still be found among dogs of the middle-east. Basenjis have evolved separately now for some time. 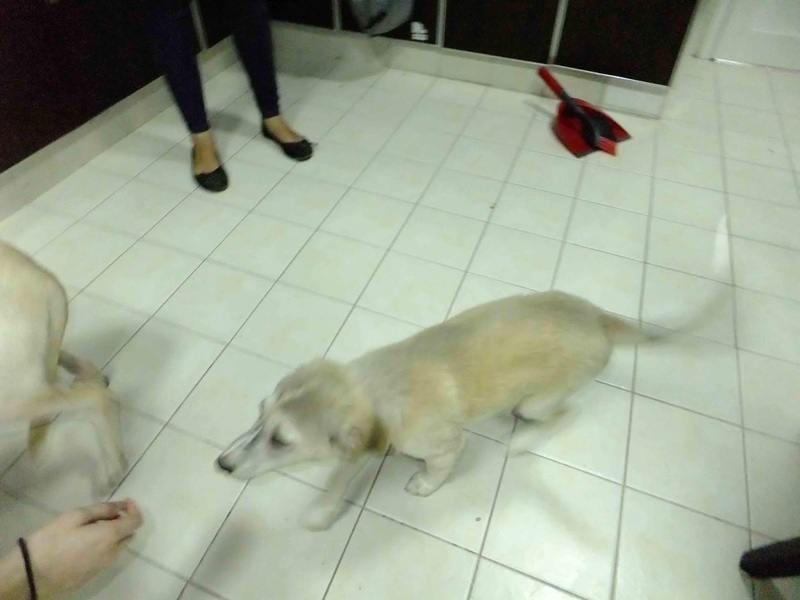 The second cluster is with what is now human controlled “breed” registered as Canaan dogs. 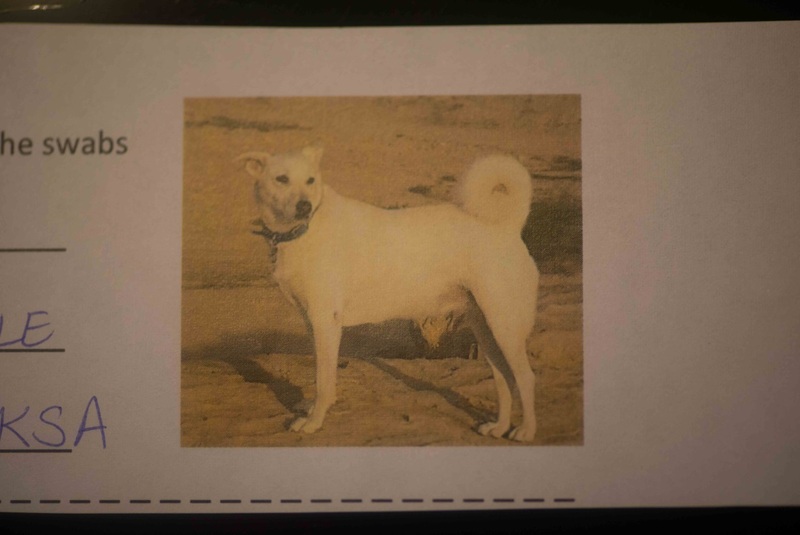 These have the same genetic origin with Canaan dogs having been selected from a small number based on appearances without reference to their genetic makeup, since such testing was not available when the breed was established several generations ago. It is to be expected that pedigree Canaan dogs would now have less genetic diversity than our pariahs. The dogs included in this ongoing work include some born in Jeddah, Al Qassim, Riyadh, Dammam, Doha, Dubai and other emirates and Sohar. All of them have an ancient connection and are not mixes of modern dogs. Some had been adopted and living in homes or were in K9 friends, Dubai shelter and some were still living free but were being provided with food and water and had become accustomed to people. First is the overall tree as published previously by Elaine Ostrader et. al. 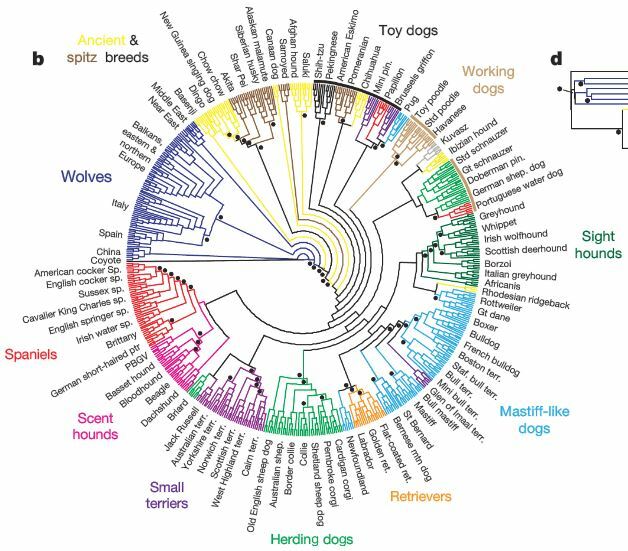 It shows where Canaan dogs fit in the world of dog genetics but our dogs had not been included when published. Small numbers on the lines in black are the bootstrap values. That indicates how many times out of 100 we ran the same data and got the exact sample architecture of the tree. This tree is amazingly good with most data being at 100%. The Canaan dogs are not necessarily closet to the Saluki. Remember that this is a two dimension graph that can exist in three dimensions. So the branch with the Saluki can be flipped 180 degrees, putting them closer to anything left of the saluki. What matters here is the branch position. Like a real tree--what is relevant is what branch comes from which larger branch, not the twisted position of the single small branch. So focus on the branch structure. " 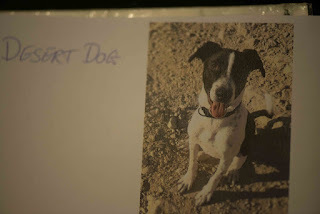 Photographs of the dogs included in these groups and identified follow. First those clustered with Canaan dogs then those clustered with Basenjis. THANK YOU FOR ALL WHO PARTICIPATED IN THIS, WITHOUT YOU WE COULD NOT HAVE DONE IT. THESE DOGS ARE IMPORTANT AND DESERVE FULL RECOGNITION AS A PART OF THE NATIONAL HERITAGE OF THIS PART OF THE WORLD AND THE OVERALL WORLD OF DOGS. As more information comes to hand I will update it. The difference between “pedigree” and “pure” dogs. A pedigree is nothing more than a record of parentage kept by kennel clubs. It is basically a family tree going back some generations. A pure dog of any breed is one that shows no evidence in its DNA of any other breed amongst its ancestors. It needs to be understood that there are no genetic markers that prove a dog is pure. There is no requirement for pedigree dogs to have been checked using DNA analysis to prove the purity or health of any of the dogs. This is not surprising since until recently accurate DNA testing was not available. Most breeds have only come into being within the last couple of hundred years through human manipulation to obtain a desired function, look, or temperament. Some breeds were established by mixing other breeds to obtain the desired type of dog. Pedigree dogs have gone through a genetic bottleneck with loss of natural genetic diversity and often an increase in genetic health issues as an unintended side effect. Since breed registers are closed and not all dogs born are used to breed, the genetic diversity is likely to decline further. Some breeds such as the brachycephalic (short snouted) ones are in reality deformed and have breathing problems and should no longer be bred regardless of them having a pedigree. Others have been bred with a view to wining shows, which of course helps to sell them, but also in some cases may have a negative impact on their health. Any attempt to now eliminate these genes that are associated with health issues would of course also lead to further reduction in the overall genetic diversity of pedigree dogs in already closed pools, so is a complicated process. Other factors may also be involved and the likelihood of a dog developing health issues can be seen as a sliding scale, with absence of a given problem occurring being lowest in a dog without the associated gene, with an increasing chance in a dog with one copy of the gene (considered a carrier) to a greater risk in those with 2 copies of the gene (at risk). In some breeds, such as the Rhodesian Ridgeback, there is even a requirement in the breed standard that they have what is known to be associated with a risk. Open dermal sinus that need surgical intervention, have a greater chance of developing in ridged dogs and yet some breeders have gone on public record saying they euthanize any dog born without a ridge ie. the healthier ones may be killed! But hey they have a pedigree and come from “responsible” breeders. Embark describes how breed analysis is done as follows:- “Breed analysis is based on comparing your dog’s DNA with the DNA of dogs from over 250 breeds, types and varieties. All dogs are related and share some DNA. Siblings share lots of their DNA (half of it in fact), cousins share a bit less (an eighth), and so on. Because dog breeds are made up of a closed group of dogs, all dogs in that breed share a lot of their DNA, typically about as much as second cousins, though it varies by breed. Different breeds that are closely related share somewhat less DNA, and dogs from very different breeds share even less DNA (but still much more DNA than either dog shares with a cat). Many freeborn pariah dogs, also known as landrace or village dogs worldwide have been shown to be 100% pure. They seldom have a pedigree, often have fewer health problems, since natural selection often means less chance that those with health issue would survive, and they maintain the wide genetic diversity that nature gave them. These dogs are not mixed mongrels or strays, but of course those do occur as well. In general they also have lower coefficient of inbreeding than do most pedigree dogs, a factor that also makes them more likely to be healthy. 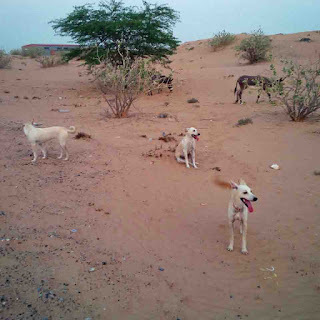 Copy and paste the following links to your web search to see the results of just 2 of the natural pariah Arabian desert dogs of the type used to establish the human controlled Canaan breed. 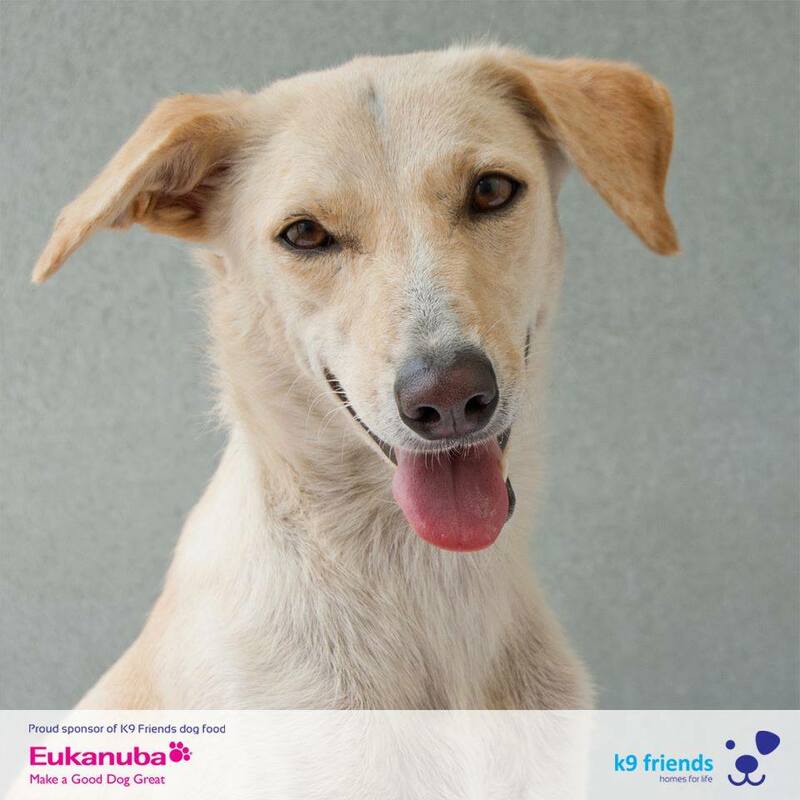 There are links on them to other similar dogs and there is no reason anyone looking to adopt a dog from the middle east could not get it tested if they are concerned about what other dogs may be in its genetic makeup or that it could have hidden health issues . The OFA testing done on pedigree dogs in the USA is not expensive and few pedigree dogs used to breed have been tested by Embark for the over 150 potential genetic diseases they may or may not have. Some of the first DNA breed testing, as well as some still current, use older technology and were not accurate but newer ones currently look at 200 000 or more alleles with good accuracy. Embark remains the only one with data on “village dogs”. 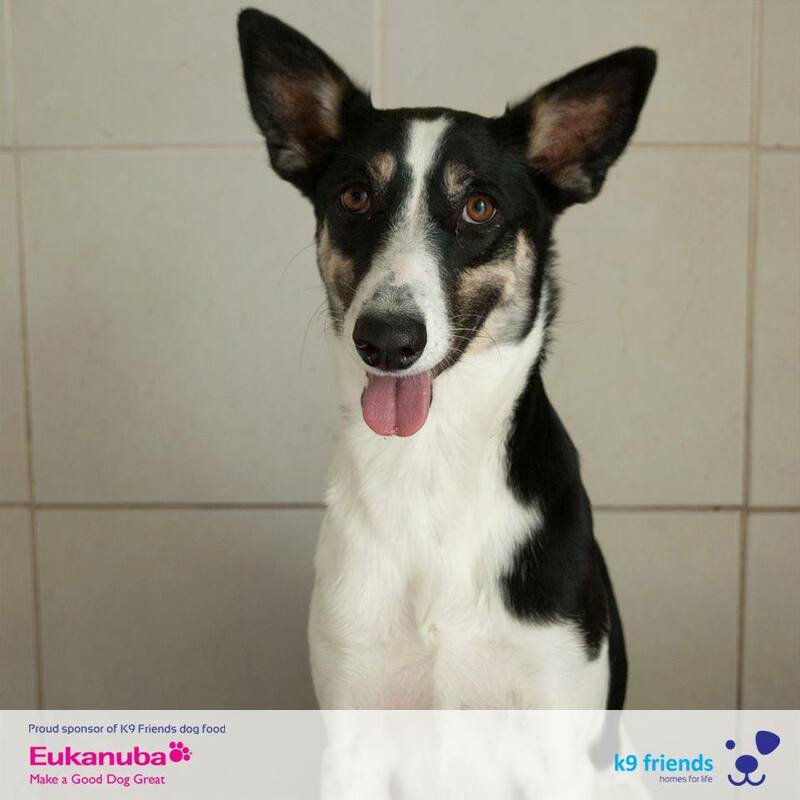 Embark also does have DNA identification for Canaan dogs but sadly for some reason no owner has allowed the data to be shown publically, for reasons known only to them. 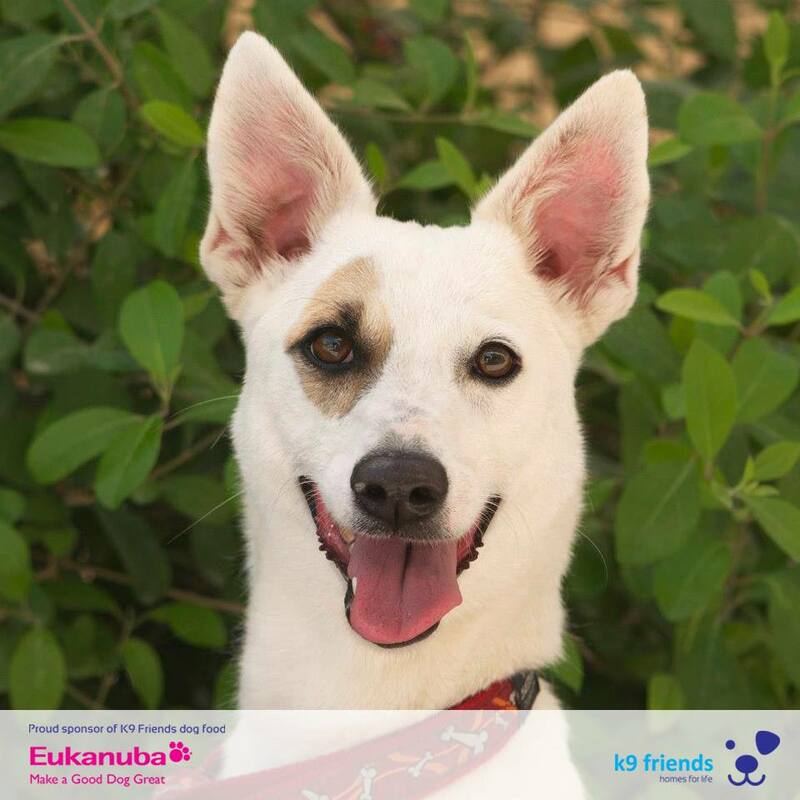 With less than 30 dogs having been tested no overall statistical data can be provided on pedigree Canaan dogs. 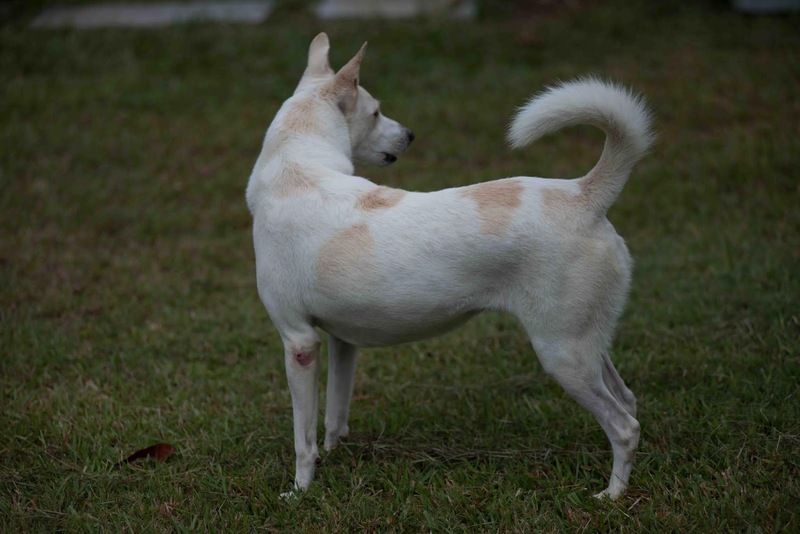 So what do we know of the health of pedigree Canaan dogs. Well we know that a famous Italian breeder stopped breeding for a while after it was found that all her inbred dogs had a health issue. We know that “My dog DNA” (https://mydogdna.com/) has identified a renal disorder in pedigree Canaan dogs known as hyperuricosuria (HUU). 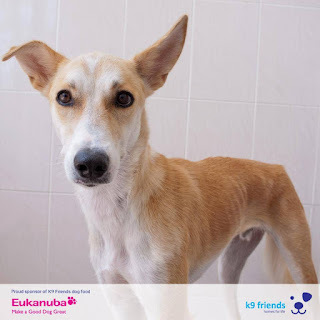 Hyperuricosuria (HUU) is an inherited disorder in dogs that can cause hyperuricemia and predisposes affected dogs to the development of urolithiasis (urate stones) in the kidneys and bladder. The disease is very common in Dalmatians but is seen in several other breeds as well. Hyperuricosuria is inherited in an autosomal recessive manner. The Embark DNA analysis tests for this as well as over 150 other potential genetic health issues. This condition causes kidney and bladder stones composed of urate; if caught early, it is responsive to dietary management. Uric acid is an intermediate of purine metabolism. 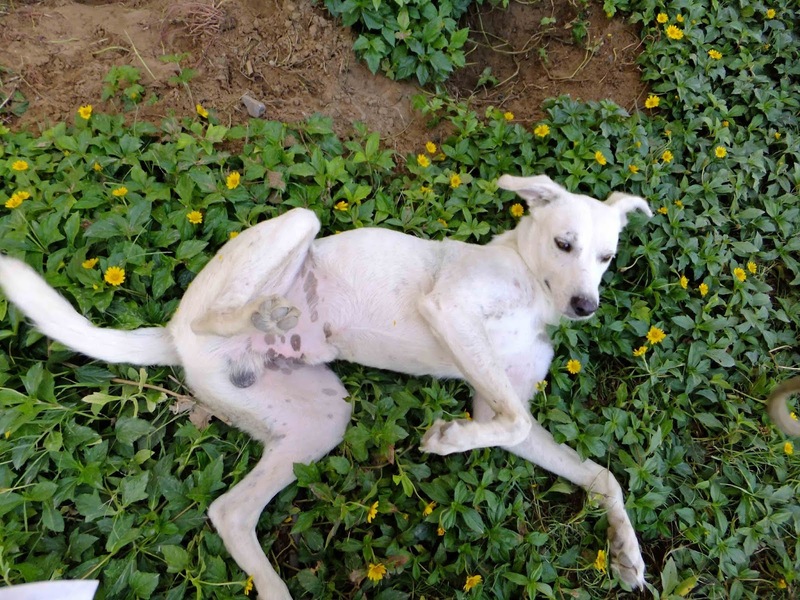 In most dogs, uric acid is converted to allantoin, an inert substance that is then excreted in the urine. Dogs with HUU have defects in the pathway that converts uric acid to allantoin. As such, uric acid builds up, crystallizes and forms urate stones in the kidney and bladder. While hyperuricemia in other species (including humans) can lead to painful conditions such as gout, dogs do not develop systemic signs of hyperuricemia. Urate stones are invisible on X-rays and must be diagnosed by a veterinarian via ultrasound or urine sediment analysis. If left undiagnosed, bladder stones can lead to urinary obstruction, which can be life threatening. When ranked with position 1 being the worst, Auto- immune thyroiditis in Canaan dogs Ranked 31 out of 114 breeds where more than 50 have been tested. 6% were positive of 167 tested. 13% were abnormal and a further 6.6% gave equivocal results. At any point in the dogs life a negative result does not rule out future development of this occurring thus in the dogs life time it is possible a greater number could be effected. Degenerative myelopathy was worse, ranked 22 with only 55% giving normal results and 38% were carriers. Degenerative myelopathy of dogs (also called chronic degenerative radiculomyelopathy) is an inherited disease that occurs in German Shepherds, Pembroke Welsh Corgis, Boxers, Rhodesian Ridgebacks, Chesapeake Bay Retrievers, and other breeds. Affected dogs exhibit degeneration of nerve fibers (axons) and the sheath that surrounds them (myelin). 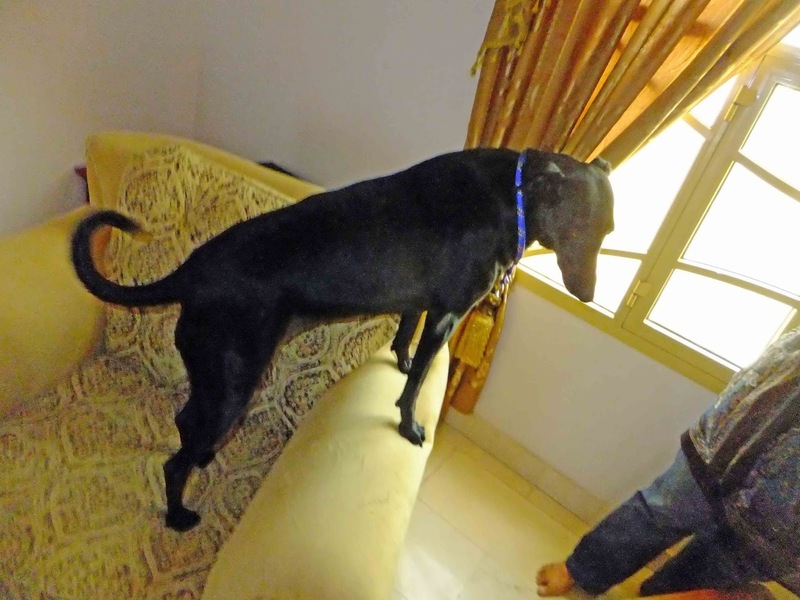 Dogs with the condition are usually older than 8 years of age and slowly start to display nonpainful incoordination and weakness of the hind limbs. It can be confused with orthopedic disorders (such as arthritis), but dogs with degenerative myelopathy have difficulty sensing and placing their feet normally whereas arthritic dogs do not. Unfortunately, there is no specific treatment for the disease, and most affected dogs are euthanized within 1–3 years. The testing done by the OFA is very limited looking at only 8 issues compared with over 150 known genetic health issues so has very limited value. All breeders are individuals and most responsible ones do take steps to be careful the dogs they breed are healthy as far as possible but statements that Canaan dogs bred for sale are somehow healthier than those directly introduced from rescue groups simply do not stack up. The Canaan breed was established from some 30 founders simply collected from the local pariahs, mostly from Israel but one of the first in the UK came from Jordan after an overland move to Libya with Bedouin. Myrna Shiboleth also has added dogs rescued in Jordan and yet says "Rescue group that rescues street dogs, love to call them Canaans, but they are not". 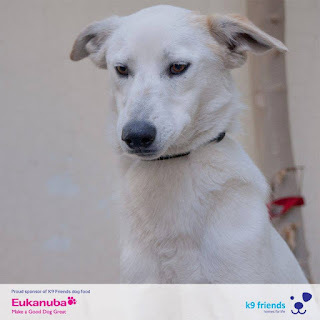 Yes it is true that most rescue groups give an identity to their dogs because potential adopters ask and they may be wrong and some do think that every dog found in the middle east is a Canaan which is not the case. No one can claim none of them are Canaan dogs without even seeing them anymore than they can all be called Canaan’s. 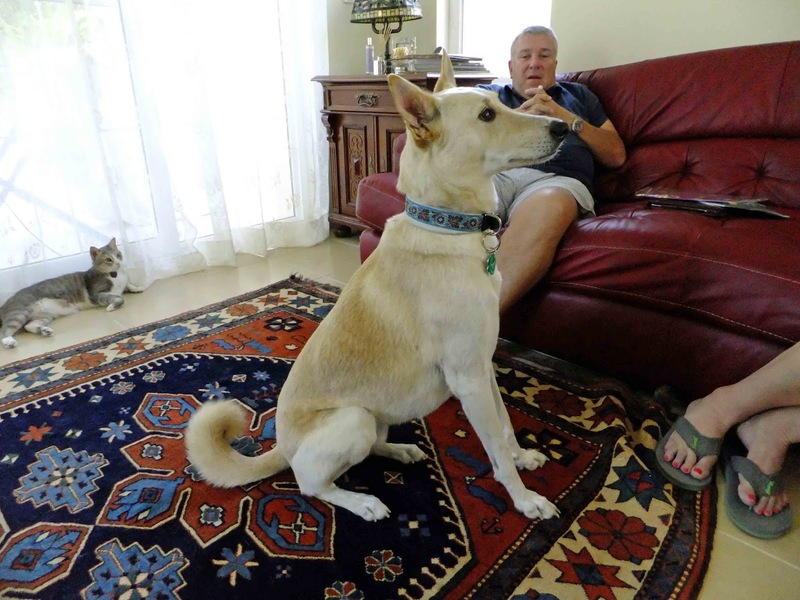 A number of shelters in the USA also tag dogs as Canaan dogs which in some cases have probably not been bred by Canaan breeders and have not come from the middle east. It has been claimed that some 200 rescue dogs are imported to the USA annually and that 60 (a guess) dogs labelled as Canaan dogs have asked (and been rejected) for help in homing them through the Canaan rescue network. No supporting facts were presented to show that these dogs all originated in the middle east so this claim is meaningless. How is it that in the USA it is claimed that all responsible breeders will always take back a dog they have bred if no longer wanted and yet there is a need for a Canaan Dog rescue that admits to “ 4-5 legitimate Canaan rehome requests for help in a year “ out of an estimated “50 to 70 true Canaan pups are born yearly”. That’s as many as 10% needing to be re-homed and not taken back by the breeder! 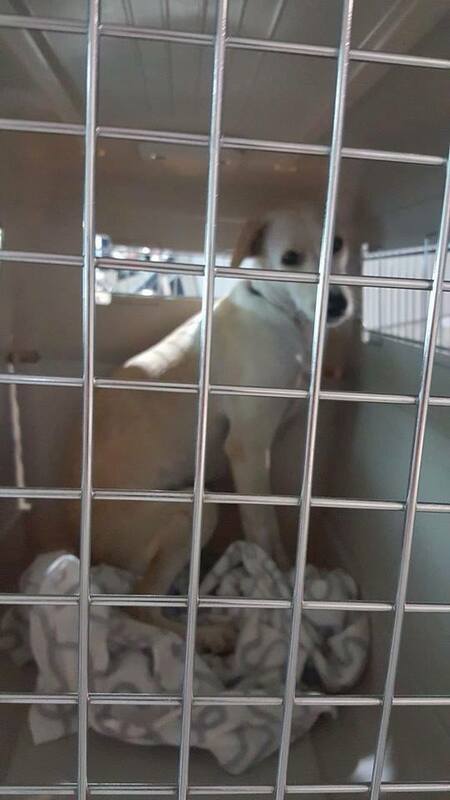 People involved in trying to home dogs in the middle east are NOT profit making groups that rely on selling deliberately bred dogs for a living. They manage entirely on fund raising and help from volunteers and some have considerable debt at veterinary practices that have to make money to stay in practice but still do all they can to help. One of the often stated points of pedigree Canaan dogs is that they are a primitive (I prefer ancient) type so why is it claimed by a Canaan person that this is some sort of bad thing in a middle east dog? The USA, like most countries, has its own health checks and requirements before a dog can be imported and while there has been a case of imported rabies as a result of false documentation from Egypt it was picked up during quarantine and rabies already exists in the USA so just what “weird diseases and parasites” are going to enter the USA that are not already there? I am as passionate as anyone about the need to preserve these dogs with an ancient heritage but to claim that the pariahs used to establish the Canaan “breed” are only found in Israel shows a lack of knowledge and is not supported by what facts we know. Yes they are a type with ancient heritage but to say they are the oldest type in the world is unsubstantiated and not true considering what we presently know of ancient types. Nor is it accurate to say that these pariahs are becoming rare worldwide. Only some 15% of the worlds dogs are pets and an almost insignificant percentage are pedigree dogs. (Coppinger and Coppinger “What is a dog”). 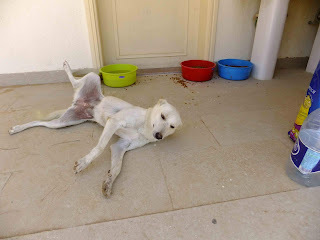 The whole situation of dogs in the middle east and in other countries is vastly different to that in the western world and this is something people living in the USA or other “developed” countries unfortunately fail to understand, as do many expat westerners living in the middle east who tend to see homeless dogs through the limited experience they have in their home countries where pariahs are not found. 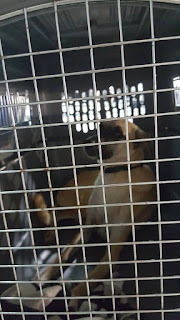 If Canaan breeders genuinely want to preserve these dogs and seek “to still bring in and preserve extant free living dogs and their bloodlines” then it is high time they recognised that there are thousands of these dogs out there. They also need to understand the true history of these dogs, something that has far greater significance than the made up story aimed at selling pups of pariahs, initially in Israel. As Myrna Shiboleth stated recently in her open letter: “When I started with the Canaans, nobody in Israel, other than my mentor, Prof. Rudolphina Menzel, and her few supporters, considered them to be anything other than an Arab street dog and garbage dump scavenger.” While dogs know nothing of human nationality, religious or cultural divisions, that of course is precisely what these pariah dogs are. Myrna herself knows that they are not officially “Israel’s national dog” yet continues to claim this as do other breeders. I have no problem with any country making them the countries national dog but to do so needs government declaration which does not exist. 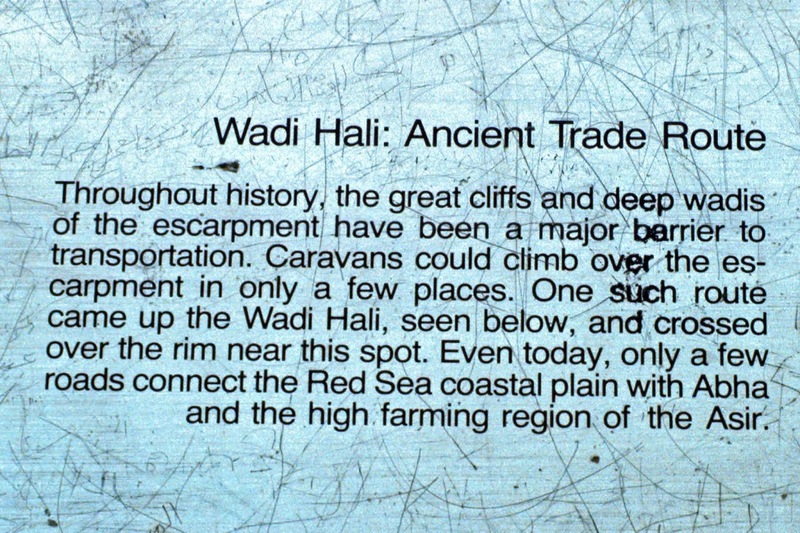 Calling the free living dogs outside of Israel as “baladi” again shows somewhat lacking understanding. Baladi is a word used specifically in Egypt and most closely translates to English as “folk”. It is used in Egypt not only for dogs but to describe many other folk activities such as dancing etc. 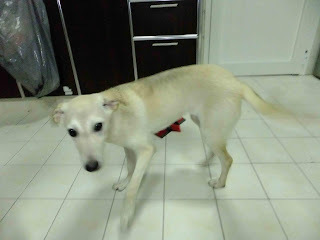 ie, baladi dance, baladi songs and yes baladi dogs. 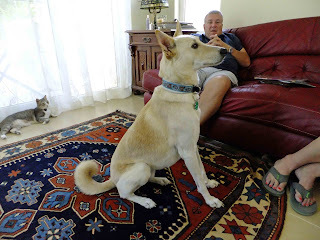 If the unsupported claim that that Canaan dogs were introduced to Israel by the followers of Moses were true (facts show they were in the middle east before that time) would the dogs in Israel not be baladi dogs? It is shameful and disappointing to see claims of “knowledge shared” when the knowledge being shared is extremely limited and inaccurate and the approach to someone trying to learn at times extremely rude. So yes indeed THINK and get your facts right and share correct information not that dreamed up in order to sell dogs, before condemning others. There is still a golden opportunity to forget about ridiculous kennel club closed book regulations and bring in more of these dogs while concentrating on maintaining genetic diversity and eliminating all known genetic health issues. How can this be done? Very simply by firstly recognising the true distribution of these dogs then testing all current dogs for all known genetic issues and not using any that are even carriers. This cannot be done with closed breeds. It can be done with these dogs because there are still thousands that could potentially be used. 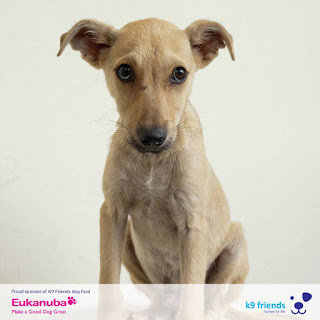 While rescue groups invariably neuter dogs before homing them I don’t doubt they could be persuaded to help breeders for the sake of ensuring the long term future of these dogs. Simply choose ones breeders fancy and get their DNA checked for purity and health before adding them to breeding stock and avoid any (probably rare) that carry any potential health issue. Once no genetic health issues are present there is no need to test offspring. No current established modern Euro-breed has such an opportunity. Do I expect this to happen with Canaan dogs? No, not with the arrogant and often ill-informed attitude of some people involved. What came first Pedigree Canaan dogs or desert pariahs? Whether the chicken or the egg came first depends on how we look at it. If the question refers to eggs in general, the egg came first. The first amniote egg — that is, a hard-shelled egg that could be laid on land, rather than remaining in water like the eggs of fish or amphibians — appeared around 312 million years ago. In contrast, chickens are domesticated descendants of red jungle fowl and probably arose little more than eight thousand years ago, at most. Simple? Well no! If the question refers specifically to the chicken egg as it exists today, the answer may be different. Chickens produce a protein, ovocleidin-17 (OC-17), that is expressed in the uterus and causes the formation of the thickened calcium carbonate shell around modern chicken eggs. Because OC-17 is expressed by the hen and not the egg, the bird in which the protein first arose, though having hatched from a non-reinforced egg, would then have laid the first egg having such a reinforced shell: the chicken would have preceded this first 'modern' chicken egg. So what came first the pedigree human controlled modern Canaan breed or the true natural pure ancient free-living dogs found in the Arabian peninsula, north Africa and eastern Mediterranean countries? 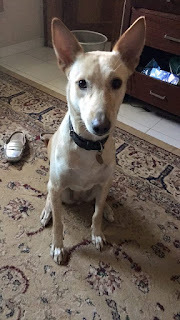 Unlike many people who have never been to the areas where these dogs exist and yet make unsupported claims, I worked in the middle east, in Saudi Arabia between 1990 and 2007 in a number of wide spread places and travelled throughout the country and neighbouring ones. During that time I spent most weekends cross country walking and driving off road to remote areas that had no roads so have some first-hand personal experience of the region and the pariah dogs found there. I have continued my strong interest in these dogs ever since. 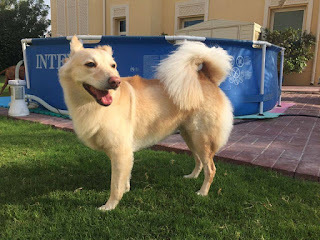 I noticed that everywhere I went in Saudi, within a few hours walking time of human habitation, there were dogs to be found. While occasionally some were seen in towns, more often at night when people were not around, most were around the outskirts or near picnic areas, where they could scavenge for discarded food, and of course near rubbish dumps. 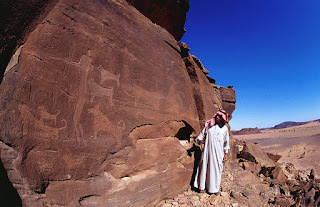 They were also to be seen with the still nomadic Bedouin at their camp sites and with their goat or sheep herds. Not once did I see them herding, they were watch dogs giving warning of the presence of strangers. No one breeds them. If someone wants a dog they simply collect a pup from a den. 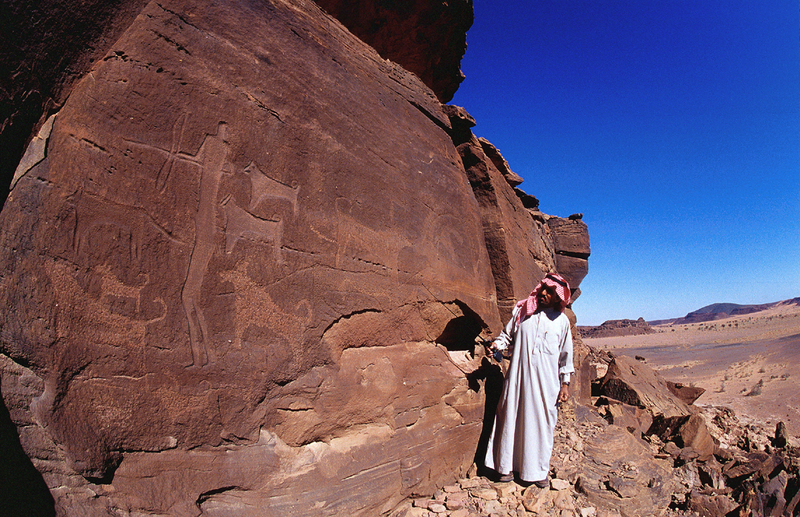 Saudis were all aware of these dogs and referred to them as their wild dogs that had always been there and they were also aware that the Bedouin often kept them. Most of these dogs had the same overall appearance of upright ears and curled tail, the typical appearance of Long Term Pariah Morphotype (LTPM) wherever they are found. I do not believe they should be referred to as “village dogs” since by far the majority were not to be seen wandering the streets as do village dogs elsewhere. However call them what you will desert dogs, wadi dogs whatever that is not important. 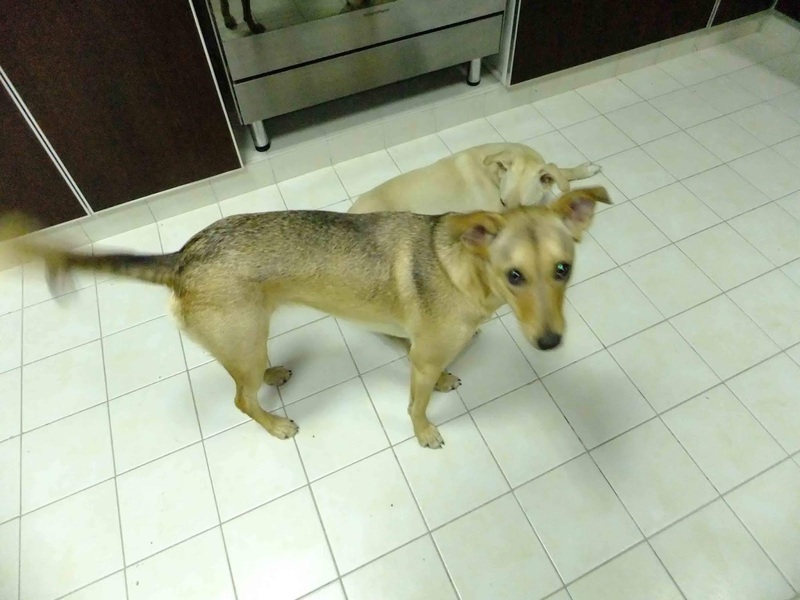 They are not strays since they have not strayed from homes, they are not mixed mongrels since there are no other dogs to mix with. Many people were only aware of the relatively few that were sometimes seen in the streets and the others kept a low profile and were easily missed. While this general LTPM type is found on many continents they are not all identical, having been separated geographically for thousands of years and we know that not all genetic markers found their way to all areas of the world. Those people who are familiar with them can recognise the differences. For example I have sometimes been asked in Australia if my middle-east dogs are dingoes but anyone who knows dingoes recognises immediately that they are not. A less common type had floppy ears but were otherwise similar. Colours were varied but mostly cream to brown with some black or black and white. There have been claims that the black dogs are predominant in mountain areas but this was not my experience. At any given time the predominant colour could differ depending more on random breeding patterns. Saudis have traditionally not kept dogs as pets and have been actively discouraged from doing so in the past, although this is changing. Most of the euro breeds of dogs in Saudi at the time I was there were brought in, owned and re-exported by expats and were kept in closed compounds so there has been little chance of any breeding between these free living pariahs and what westerners know as dog breeds, unlike the situation in other nearby countries where euro-breeds have now been popular for some time. This also is changing, particularly in the large cities such as Jeddah and Riyadh. Occasionally on our walks someone would want to take a puppy from a den we found. I used to discourage this, particularly with Australians, due to the difficulty of keeping them in apartments, for those not living in a villa, and because of the quarantine requirements taking a dog to Australia. On my last contract I eventually took in some of these dogs myself after they found their way into our compound and some people were calling for these “wild” dogs to be killed. One of these dogs took 6 months of many hours spent each night in his presence, coaxing and encouraging him before he would allow me to contact him. I had no idea what sort of dog they may be until I chanced on an Encyclopaedia of dogs while browsing in a Sydney bookstore and spotted a photo of what looked exactly like one of my dogs. 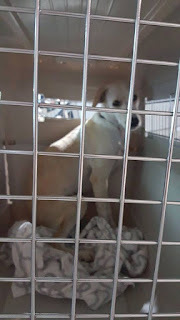 Armed with the name “Canaan” I then came across Myrna Shiboleth, contacted her and sent her a number of photos and videos of my dogs and described to her their behaviour. She acknowledged to me that if she was to see them in a show ring she would consider them very good examples of a Canaan dog. Photo below courtesy Lars Bjurstrom. We may never be absolutely certain as to where, how or why dogs were first domesticated but current genetic studies point to South East Asia since that is where the greatest genetic diversity has been found. 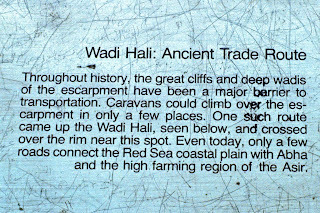 From there it seems most likely that they spread to the rest of the world and through the middle-east into Europe and Africa. 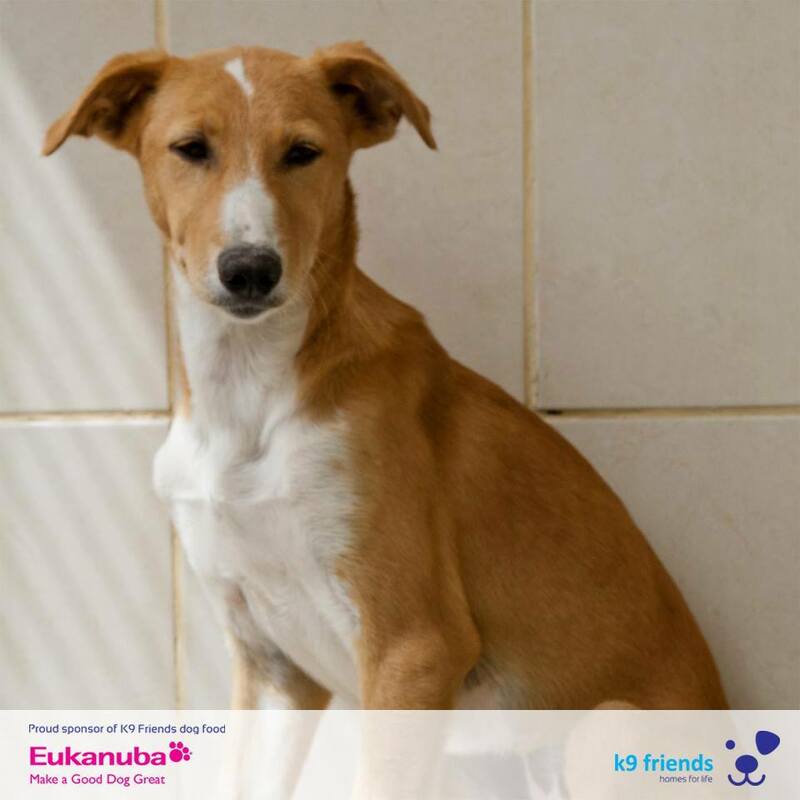 Most of what are now recognised by kennel clubs as distinct breeds have come about only in the past few hundred years due to human desire to produce dogs suited to particular work or simply for a certain appearance. This selective breeding has resulted in breeds that have lost much of the genetic diversity dogs had naturally. In some cases some breeds are in reality deformed and should not be bred at all. 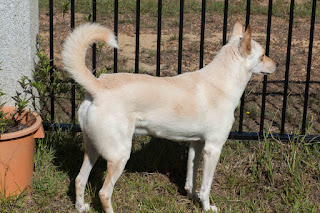 Menzel, who wrote the first kennel club style description of Canaan dogs, recognised more than one type of these dogs and initially both types competed in show rings but later she decided to narrow in on the type now considered Canaan dogs. Considering the early history and migrations of humans it seems highly unlikely that the free living LTPM dogs in this region are not all the same ancient type. 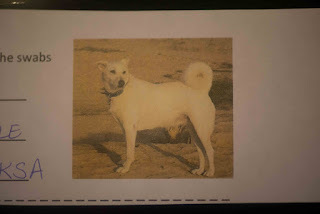 The Canaan dog breed was established by selecting a relatively small number of free living dogs, mostly from what is geographically a very small area with a few added, even recently by Myrna Shiboleth, from Jordan. 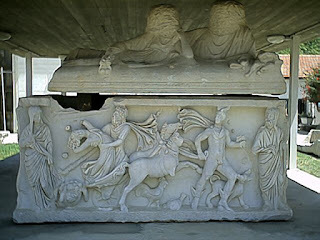 We also know dogs were buried at Ashkelon in ancient times but quite why is debated. 3 Also found in Ashkelon was this sarcophagus that shows a dog of familiar LTPM appearance. 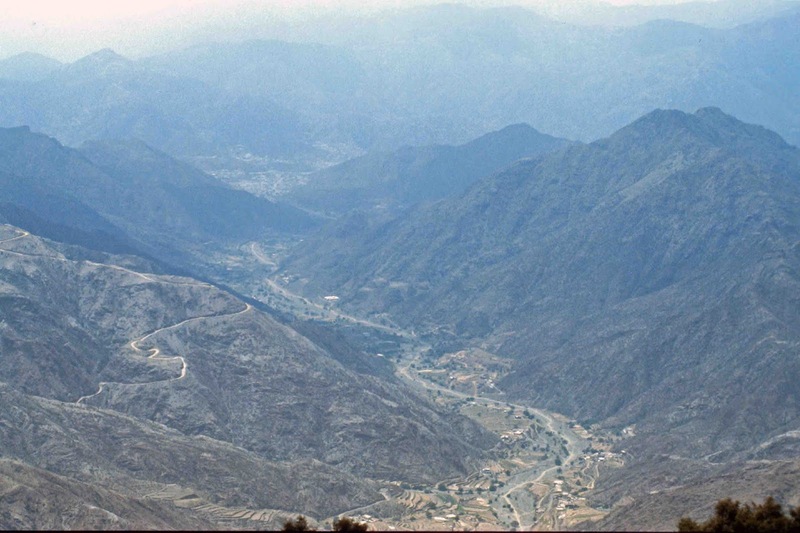 Israel's area is approximately 20,770 km2, which includes 445 km2 of inland water. 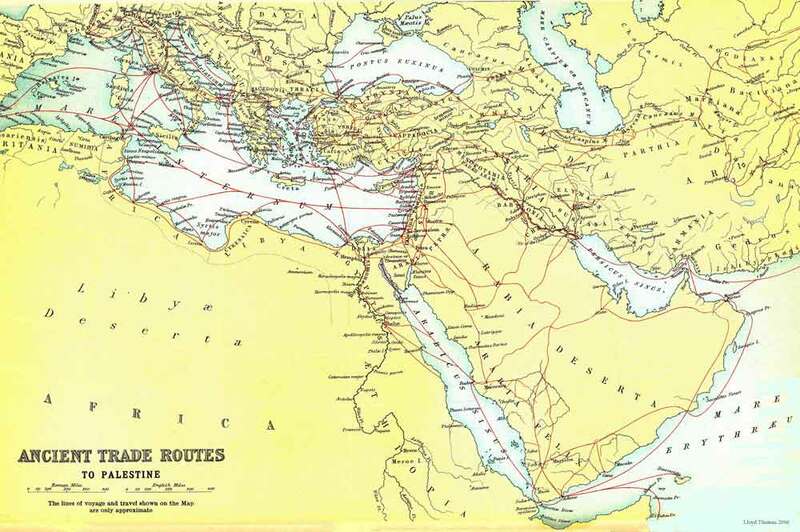 Israel stretches 424 km from north to south, and its width ranges from 114 km to, at its narrowest point, 15 km. So a total land area is 20,325 km2. Israel was established in 1948. Kruger National Park is one of the largest game reserves in Africa. It covers an area of 19,485 square kilometres in the provinces of Limpopo and Mpumalanga in north eastern South Africa, and extends 360 kilometres from north to south and 65 kilometres from east to west. Areas of the park were first protected by the government of the South African Republic in 1898, and it became South Africa's first national park in 1926. 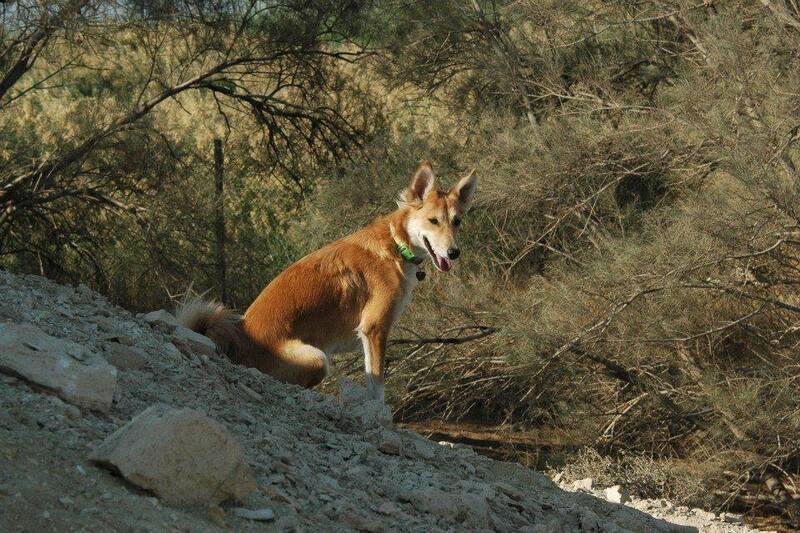 The pedigree Canaan dog was created and named by Menzel by capturing a few of the free living pariahs in Israel. While it matters not to me what these dogs are called it seems a strange choice considering that the original Israelis were often at war with the Canaanites having invaded their land. Menzel also wrote the kennel club description accepted by the Israel kennel club in 1953. On a similar scale if someone collected a few lions in Kruger national park caged them and started breeding them for sale, would the lions in the rest of Africa then not be lions? It would of course be possible that due to the human imposed selection, resulting in a genetic bottleneck, that these bred lions would show some difference in DNA analysis compared with the rest of African lions, after some generations due to having artificially limiting their genetic makeup. I suggest they would all still be lions just as all these pariah dogs are the same whatever we call them. If these ancient dogs are to have a long term future it is time to recognise the reality and importance of them ALL. They need to be recognised by the IUCN and we need to forget about the closed book imposed on “breeds” by kennel clubs, and rely on DNA testing to choose dogs that can be added. There are still thousands of dogs available and it should be possible to completely eliminate all dogs with known genetic health issues, including carriers, while still keeping and indeed concentrating on maintaining genetic diversity rather than what a judge in a show ring happens to like. After all how difficult is it to win in a show where there are only 2 or 3 dogs shown? Already there have been health problems passed on as a result of inbreeding (called line breeding by breeders) by “famous” breeders. It may be that when these pariahs were first bred for sale in Israel that having a dog claimed as Israeli could have been a way of interesting Israelis to purchase them and that they would not have wanted them if they were “Arabic”. I don’t know and am not nor ever will be a breeder but I think there would be greater interest in them by telling the complete story. It may also be that the best chance for long term survival of these dogs would be to set aside a large area similar to national parks, where these dogs could be allowed to continue to live much as they always have but possibly assisted with food, water and basic health care. Such a park could even become a tourist attraction. To have any hope of achieving that we need to have genetic evidence published that can be presented to authorities in support of such a park. 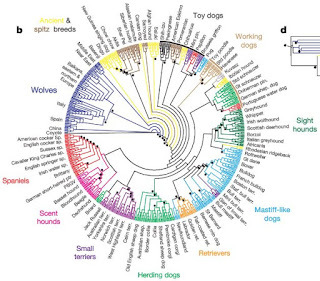 Among some registered dog breeds there are recognisable genetic differences in different continents. 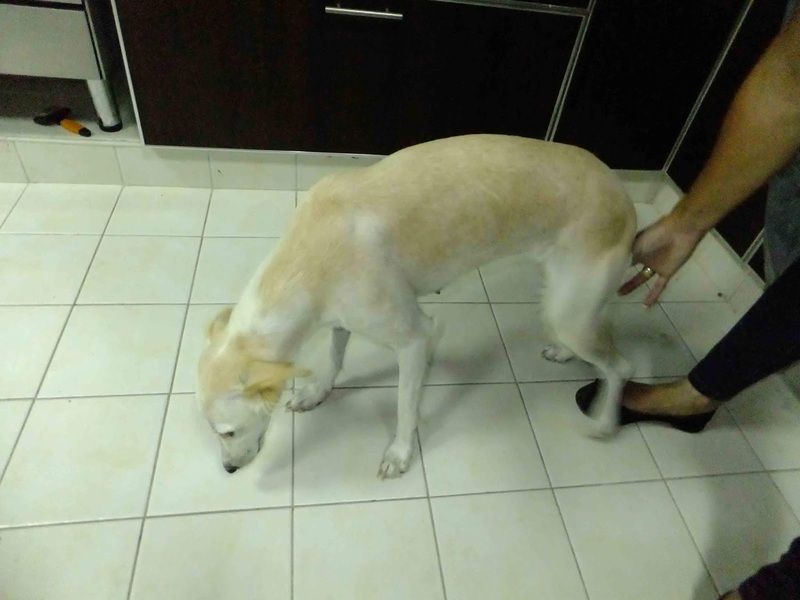 A number of claims are made relating to pedigree Canaan dogs without supporting evidence. “Canaan dogs accompanied Moses when he and his followers moved from Egypt to what is now Israel and introduced them to Israel where they were abandoned when the Israelis were dispersed.” While it is possible dogs were with Moses it is thought he took some 40 years to reach Israel so the dogs reaching Israel would not be the ones that were originally with them and would likely have bred with others along the way. 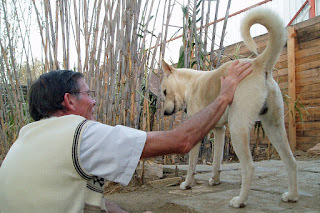 There are pariahs of the same LTPM in Egypt today, known locally as baladi dogs, a term used in Egypt for a local (non-euro breed) dogs but also for various other “folk” dances, music, bread etc. However evidence also shows that similar dogs were already in the whole region well before the time of Moses. Egypt ruled Canaan for 3 centuries after defeating the Canaanites at Megiddo in 1458 BC. Egyptian trading posts existed at Ashkelon, where a dog graveyard was found, and Gezer, 3 millennium BC. Donkeys were being used to transport goods overland in trade between Egypt and Canaan before sea routes were later established. It is likely dogs would have followed in both directions. Dogs were indeed known in ancient Israel. In fact, dogs are referred to forty-one times in the Bible. However, most times, the word “dog” is used as a word of contempt. One of the few exceptions where dogs are presented as a useful animal was when they were used to protect the flock. Job said: “But now they laugh at me, men who are younger than I, whose fathers I would have disdained to set with the dogs of my flock” (Job 30:1). In general, however, Israelites used the word “dog” as a word to express contempt. “You shall not bring the fee of a prostitute or the wages of a dog into the house of the Lord your God in payment for any vow, for both of these are an abomination to the Lord your God” (Deuteronomy 23:18). The mention of the dog in this Deuteronomic legislation is a reference to the male temple prostitutes who served in the cult of Baal. Isaiah scorns the leaders of the nation by calling them “dumb dogs” (Isaiah 56:10) and “greedy dogs” (Isaiah 56:11). The psalmist calls an evil man a “dog” (Psalm 22:20). Dogs were considered unclean animals because they ate the flesh of unclean animals (Exodus 22:31) and because they ate human flesh (1 Kings 14:11). 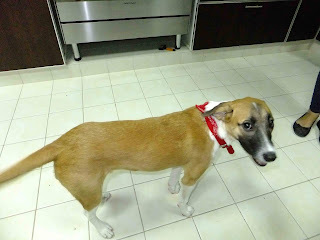 The breaking of a dog’s neck was a pagan religious practice condemned by the prophet (Isaiah 66:3). This does not imply that all people at the time hated dogs as even today it is not uncommon for some people to refer to dogs in derogatory ways. Some Canaan websites state that the name of Abel’s dog was Benoni. This comes up in a fictitious book “The Book of Lies” by Brad Meltzer and there does not seem to be any factual evidence of this. “Canaan dogs were selectively bred to herd.” There is no evidence today of these dogs being used to herd and genetically they do not fit with herders. Bedouin, who have been the people most commonly using these dogs more recently, laugh at the idea of selective breeding. If they needed an additional dog they simply collected a puppy from the den of a free living dog. Dogs living with Bedouin and accompanying their flocks do so as watch dogs to alert to the presence of intruders. 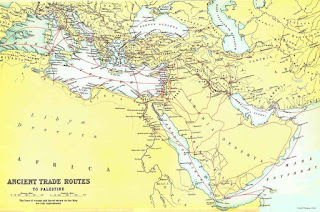 In recent times Bedouin moved freely throughout the region and dogs followed them with no regard to present day borders. Even earlier in Neolithic times dogs with this same LTPM were living and moving around with man and may have helped hunters to chase antelope into traps (desert kites)but this is not truly herding. “Canaan dogs are the national dog of Israel.” No. To be officially a national dog, flower, bird, tree etc. there needs government recognition. Sadly this has not happened. Israel does have an official national bird, the Hoopoe, but no official national dog. This is an un-official claim made by the kennel club and breeders. “Canaan dogs are an ancient breed, bred by nature as nature intended.” That is true of the free living pariah landrace but the pedigree Canaan is one of the most recent breeds to be accepted by kennel clubs. As with all kennel club breeds they are now bred largely with a view to winning shows and mating’s are controlled by breeders not nature. Bringing new freeborn stock into the genetic pool is, in general, difficult and costly due to kennel club regulations. The dogs used were chosen purely on looks so it is not known if they could have had any modern breed in them or not. “The free living pariahs are genetically different to Canaan dogs.” No study has been published yet to support that claim. It is possible there could be a difference but this is likely to be due to the human created bottle neck effect of the small number of dogs used to establish the breed. Note that this article seems to refer to “middle–east dogs” as Afghan hound and saluki only and that Canaan dogs do not group in the herding dogs. We also know that as dogs evolved in parallel with man they gained additional copies of the AMY2 gene enabling them to better digest starch with Australian Dingos and New Guinea Singer, probably the last dogs truly living completely wild, have the fewest copies. 9 Canaan and these pariahs have yet to be analysed for this. 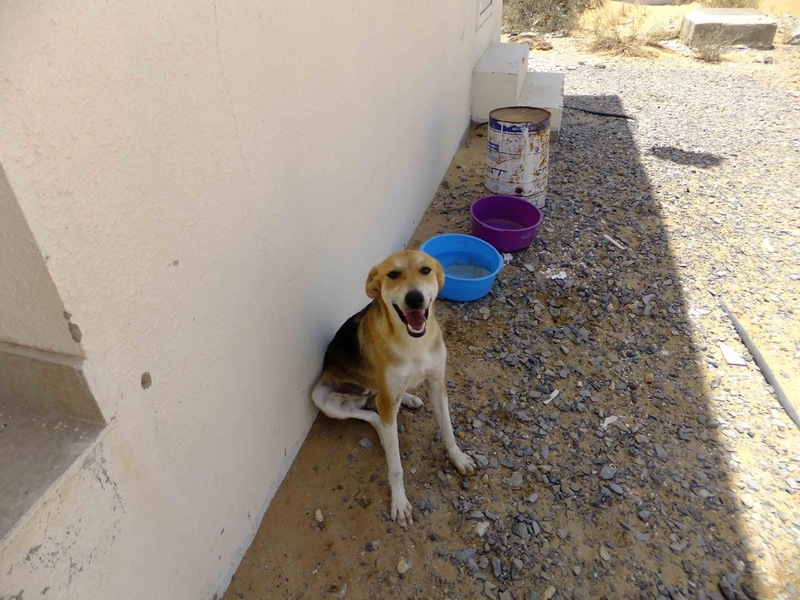 As is often the case a look at the map in this article shows a glaring absence of results for dogs of the Arabian peninsula. 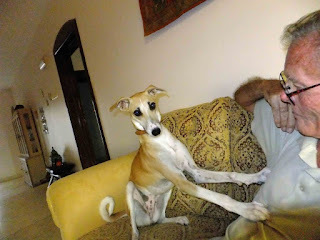 I have been trying to get these dogs DNA properly looked at since 1990 by contacting geneticists whose publications suggested they might be interested. The usual response was in general that they lacked the time and resources. More than 3 years ago I finally received what appeared to be a positive reply from Niels Pedersen at UC Davis. “We have collected many dogs from Iran and have also received samples from Saluki-like dogs kept by the Bedouins in Israel and Jordan. We would be interested in working with you on sampling dogs from Arab countries.” He also stated that the reason was difficulty in getting samples. Like many others their knowledge of geography seems limited at best. 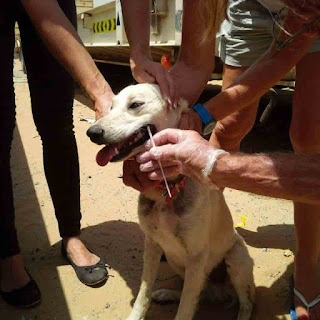 However after further correspondence I purchased swabs he approved and travelled at my own expense and with much appreciated support of others collected some samples from some 50 dogs, 3 swabs from each dog. Then followed an incredible amount of exchanges such as that the swabs had not been received (they had been signed for and were sitting in his office.) A heap of spelling errors that he blamed on writing not always being clear, in fact all the information sent was typed not hand written. Eventually after deciding to move the swabs to Elaine Ostrander at the National Institute of Health I received some raw data and this note “Here is the STR data for your dogs. We used amelonogen markers (AMELX; AMELY) to identify gender, five Y-STR markers to identify patrilines, 33 STR markers on 25 chromosomes to look at genomic differences, plus 4 markers to identify DLA class I haplotype(DLA1-3cca, 4ac, 4bct, 1131) and 3 markers for the DLA class II haplotype (5aca, 5act, 5bca). The results in red indicate that the DNA we extracted was of poor quality and/or the samples were either mold or bacterial and the results of not much value. Samples in yellow had either poor quality DNA or insufficient DNA, but did provide meaningful results for several of the genetic parameters. We only kept one of the three swabs, so it is possible that Dr. Ostrander fared better with her samples and her extraction techniques. As expected, there is a great deal of heterozygosity at every locus and in the DLA class I and II haplotypes. None of the alleles for the 33 genomic markers were unique, i.e., they can be found sprinkled among a number of modern breeds. Some of the DLA class I and II haplotypes have not been seen among the 5 breeds we have looked at so far with this test format, but they will almost certainly be found in our indigenous dog collection when we get time to test them in the same manner. The Y chromosome haplotypes were also varied in the group, as expected, and none were unique. However, if this were 30+ dogs from any given pure breed, you would usually see only one patriline. In brief, this was a very heterogeneous group of dogs with a lot of diversity. 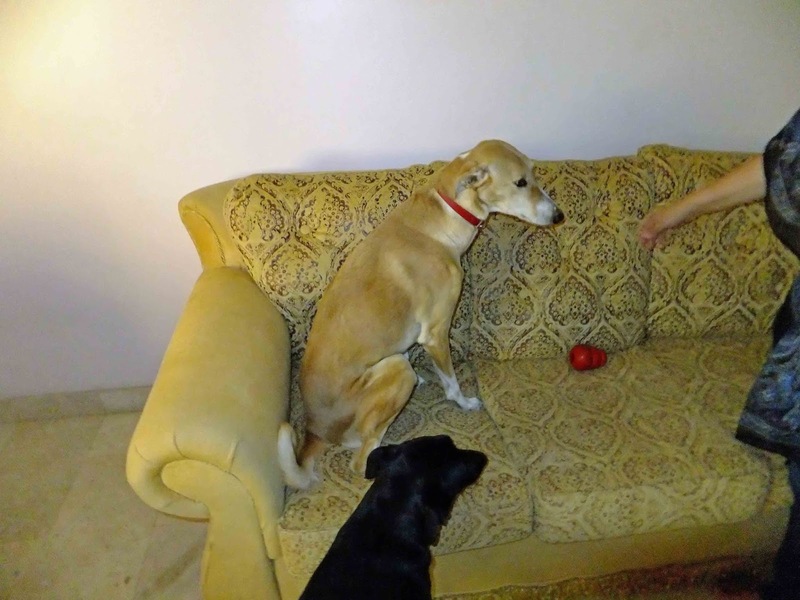 Hopefully, Elaine will be able to offer you additional information on these dogs. 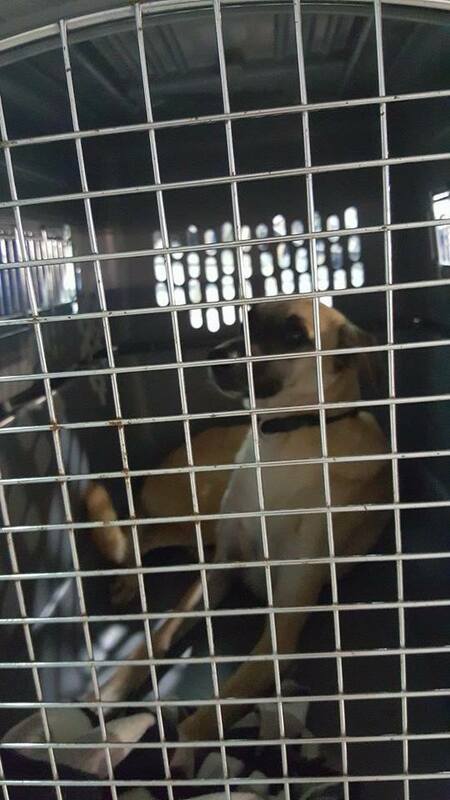 Thank you for allowing us to complete our testing and we will add this information to what we have already obtained for village dogs from this and other regions. 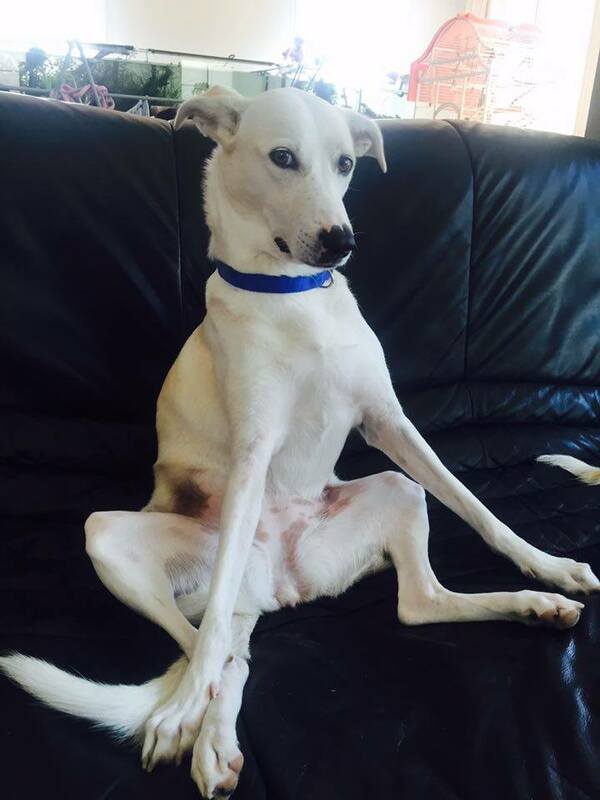 -Niels"
Some results were questionable since a known male dog was marked as female and a female as male according to the results provided. This was passed off as “they must have been contaminated”. Since both dogs were the only animal in the family this was not possible. He claimed it made no difference anyway! So moving on it was agreed that we now have a project in a collaborative study initiated by me with Elaine Ostrander at NIH and Adam Boyko (who also runs the Embark program) and that we would all be fully kept informed as work progressed. NIH received the swabs “in good condition” but additional swabs were requested. Again a lot of people were involved helping to comply and even some blood samples were collected. Having collected all the emails involved into one continuous document I have some 77 pages (without the headings). Remarks included were that the amount of DNA extracted was too little. I don’t understand that since as an experienced laboratory scientist myself I know that with modern PCR amplification even one strand of DNA can be copied to give as much as anyone could want. Another remark was that cotton swabs are not good – the swabs initially used were Dacron and designed specifically for forensic DNA use, big difference. Also mentioned was that it does not store well, again hard to understand since the swabs were “received in good condition” and I had been told they were excited to do them, were fully funded and would do them immediately. I of course am entirely reliant on NIH to come good and do this and not in a position to do anything but accept what they say if I ever want anything done in my life time. After some time of zero replies to my requests for information of what was happening I was contacted via someone else’s FB with a request to email Carol Beuchet. She wanted to know where she could get some Canaan type dogs other than from Myrna Shiboleth. Carol runs a money making website and FB page offering genetic studies even though she is not a geneticist. That in itself is not my problem, people have to make a living and can set up websites and FB groups called anything they choose and good luck to anyone willing to pay for such courses by an institute that actually exists only on the web. In the real world I have been informed that there is no registered “Institute of Canine Biology”. Attempts to register it were not accepted by authorities. Be aware that any DNA tests collected by her are not done by her. She also offers a certificate of the coefficient of inbreeding (for a charge) to people who have done DNA tests via her. The Embark program that does the testing already includes such data in their results. The reason she contacted me via some other FB page was that I had long ago blocked her for her rudeness I saw to many and her followers who dared ask or question anything she said and her constant attempts to advertise on my FB groups, despite my repeatedly asking her not to. She told me that the NIH was "fully funded and ready to test immediately”. Heard that somewhere before. Anyway I told her NIH already had some 50 samples from these dogs. She implied that she thought they had been lost and told me I was not to contact NIH she would, that NIH may know genetics but don’t know about dogs and that she intended to take over MY project. Naturally I immediately contacted NIH. The Canaan Dog Club of America made a “substantial donation” to her “institute” back in 2014 and until now nothing has been done. From Dayna Dreger at NIH on 8th December 2017 “We’ve done a few things with the latest pariah dog samples that you have sent us. We were able to get sufficient DNA from approximately 47 of them, enough to run on the 170K SNP chip. 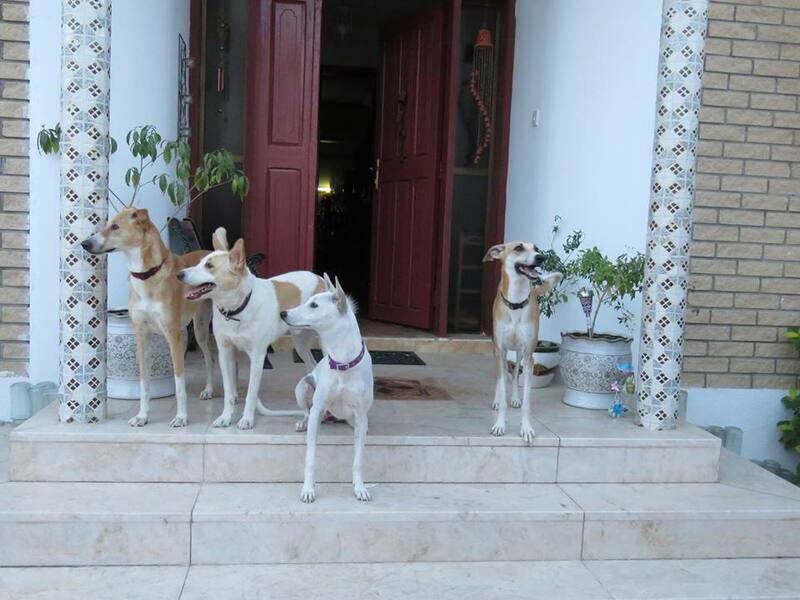 When we added these dogs to a phylogeny tree that includes 161 other breeds, most of the pariah dogs cluster into two separate groups near some of the Asian/African sighthounds (Basenji, Saluki, Afghan Hound, Azawakh, etc.). One appears very similar to a Saluki, and one clusters with the Siberian Huskies. When we have additional relevant dogs from the area, we will include the pariah samples in further haplotype and geographic ancestry analyses. I asked what other relevant dogs they are actively collecting as I could probably arrange some and received no reply. 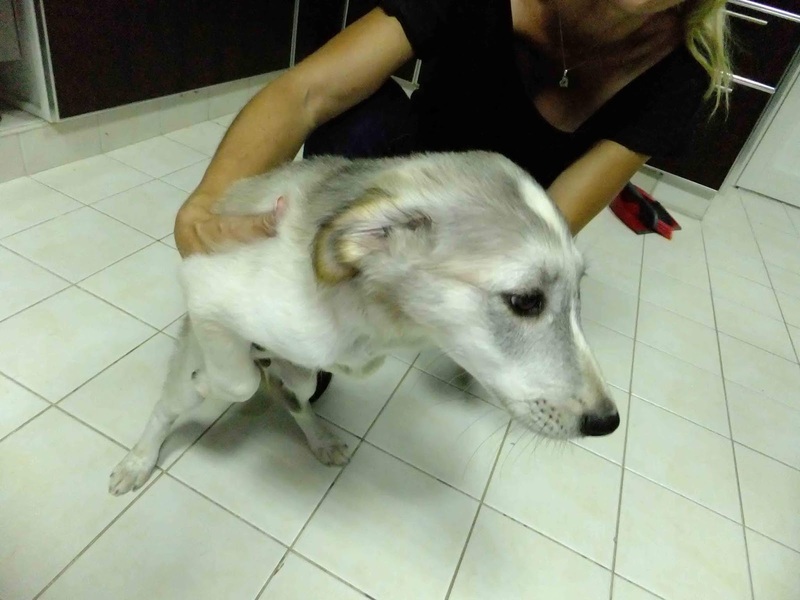 Now suddenly Myrna after only a few weeks ago telling people DNA testing to identify breeds is a waste of money, is offering to swab Canaan dogs of anyone who attends her paid weekend and has confirmed to me that this is in response to Carol having contacted her. 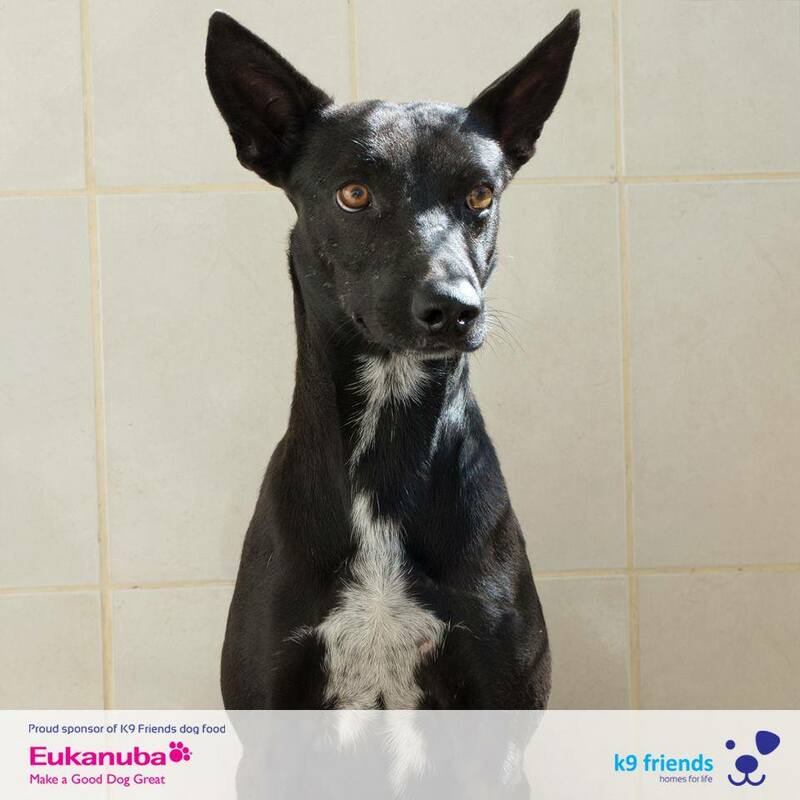 From Myrna: “21/5/2018 We are now working on developing a project to research Canaan DNA and to see if it is possible to find identifying markers in the Canaan which would help to identify free born dogs as Canaans. This is possible, for example, with the Australian dingo. I tried to start this project several years ago, but unfortunately the lab that was supposed to do the work stopped working with animal DNA, and the many samples I had collected were lost. But we now hope that we can go on with this project. This will be one of our topics at the Canaan Dog Weekend, so we hope many people will be interested in attending.” I think this weekend is not until September 2018! 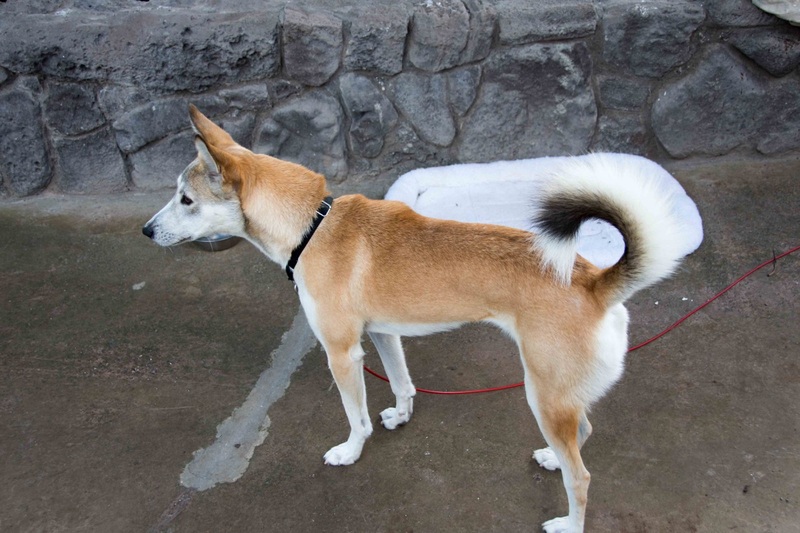 “Pedigree” Canaan dogs already can be identified in more than one good company (Not MARS Wisdom panel). Yes numbers of Canaan dogs that have been tested are small so it would be good to see more done. A publication co-authored by Elaine includes Canaan dogs (see the above chart). And Embark also can do this already. Breeders can get the full Embark test for (from memory) about $100 about 85euro. In my opinion a lot better value than getting individual genetic issues looked at. My suggestion is to either do that or contact Elaine directly as she may well send you the swab at no charge. Eostrand@mail.nih.gov IF this is to be a part of the project I initiated it would be good if it had been discussed and I and Adam had been informed. Anyone chooses to send swabs to NIH don’t expect results in a hurt if at all for individual dogs. If After the amount of effort and cost put into this by myself and others it is really poor if anyone is now trying to muscle in without any prior discussion and perhaps as a way to make money out of it by attracting people to their own money making projects. 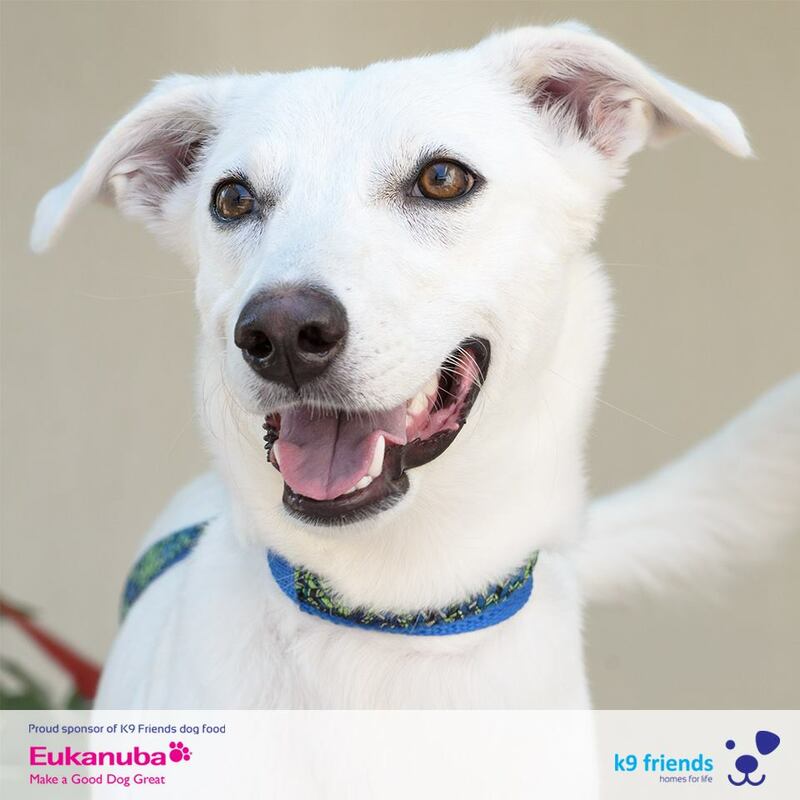 Three desert dogs or village dogs tested by embark for me were 100% pure. Of other results available publically that I have seen the most mixed one was actually from Israel! Australian dingoes are a totally different case. They have very limited genetic variation and only one haplotype.